art pilsen: Call for Artists " Collaboration Show 2014 "
In the spirit of creativity and collaboration amongst artist, we invite you and a fellow creative to submit work for this show soon. Cobalt Studio is reviewing online submissions for an exhibition of art in many mediums, with different themes and techniques. The key linking these pieces, is it must be produced by more than one contemporary artist within the past 3 years. It may very well be a blending of styles that makes this work unique. Collage and painting over one another's work...or something no one has ever thought about. Impress us. The title " Collaboration Show 2014 " is subject to change. But there are some details you will need to adhere to. 1. Submit your contact information and any relevant info for the fellow collaborators. Websites, links. 3. Submit NO more than 150 words describing the work. NO LONG Artist Statements or Bios. 6. ANY: pedestals, Audio/Visual equipment, microphones, DVD players and the like must be provided by the artist, including but not limited to wire, frames, anchors, tables, or specialized hardware. Once accepted. 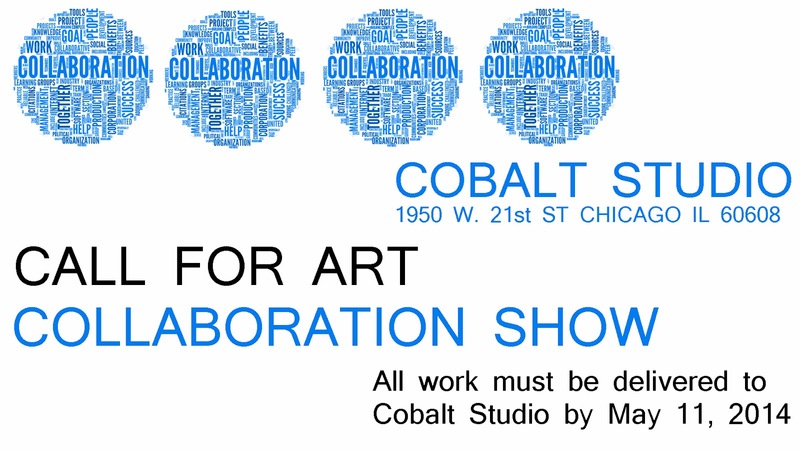 All work must be delivered to Cobalt Studio by May 10-May 11. The exhibition Opens May 16 at Cobalt Studio 1950 W. 21st Street [1st] Chicago IL 60608 The show runs May 16 - Jun 8. With extended viewing hours on weekends and by appointment. All unsold work must be picked up by Jun 8th. Hours will be posted soon.